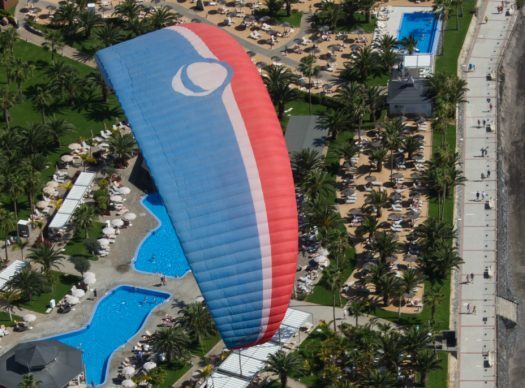 Enjoy the fantastic experience of flying over the Teide’s National Park with an unforgettable paragliding trip. Included transport to the flying area. Overfly Tenerife offers you one of the most incredible flights that can be done in paragliding: the tandem paragliding flight from Izaña. This takeoff gives us one of the most spectacular scenarios that nature has prepared for us flying from 2200 meters high. Why Teide’s flight? Surrounded by a majestic nature and Teide’s National Park, Izaña is the paragliding take-off with the highest slope in the whole Spain, taking off from 2200 meters of height to land gently in the tourist area Puerto de la Cruz or the Puertito de Güímar, around 40 minutes later. Our company provides all the paragliding equipment that our instructor and you need for this tandem flight. The things you must bring are only comfortable clothes, warm jacket, trainers and a lot of desire to have fun! You’ll receive paragliding briefing instructions before your feet take off the ground. This way our instructors will equip you with a harness and helmet and explain the take-off procedure. You will always be informed at any time so that you have a wonderful experience. Enjoy a paragliding flight from Teide’s National Park where the rock formations and the volcano reach the clouds and the views are incredible. It will be one of your best life experiences! There are two take-offs available at a height of 2250m, one facing north of the island and one facing south. These takeoffs are the highest in Europe and possibly one of the most incredible flights that exist today in the world. There our instructors will equip you with the harness and helmet and they will explain what the takeoff consists of. You will be informed at all times so that you have a wonderful experience. After you take off you will find yourself comfortably seated in a safety harness. The pilot will be able to show you the different panoramas that can be seen from this height, the Orotava Valley or the Güímar Valley, depending on where it has taken off. The duration of the flight is 40 minutes aprox. But you will need 4 hours of total time for the excursion including transportation. The landings will be on the beach of Puertito de Güímar or Puerto de la Cruz depending on the choice of takeoff on the day of the flight.